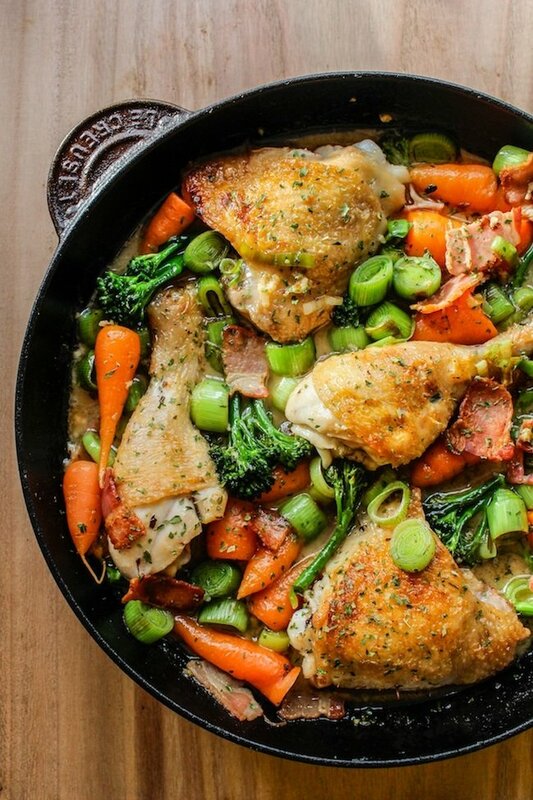 White wine braised chicken with carrots, broccoli, sautéed leeks, and bacon bits. Happy November! How was your Halloween? Mike and I had tickets to see Joanna Newsom in Manchester which was a m a z i n g. Despite dodging eggs after the show as we raced through the streets of Manchester trying to catch the last train to Liverpool, it was a great night. It was actually a pretty funny situation – eggs were falling from the sky left and right. There must have been people in the building along the street dropping eggs on unsuspecting victims below. The second Mike realized what was going on he was off, pulling me along until we cleared the danger zone. Oh, Halloween. Mischief behind us, we’ve made it through another month. I probably already said this, but I can’t believe it’s already November. Where is the time going? I’m already hearing Mariah Carey Christmas carols on the radio – insert Ned Stark ‘winter is coming’ meme here. With the cooler weather and shorter days I’m after warm and comforting meals. Playing around with my Crispy Chicken in White Wine sauce, I ended up with this white wine braised chicken which reminds me of the traditional French dish coq au vin. More traditional coq au vin typically uses red wine (but I didn’t want to end up with purple chicken) and creamy mushrooms. The only thing that was missing from this meal was the fact that I didn’t already have a loaf of french bread ready made to dip into the white wine sauce in between bites of chicken. Even more excuse to make it again, I suppose. What I love about this recipe is the fact that everything can be made mostly in one skillet with the exception of using one small frying pan towards the end. You start off searing the chicken on both sides before pushing the thighs to one side so that you can also fry your bacon until lightly golden. From that point you simply add your stock and white wine and allow the chicken to simmer and cook in the sauce before adding your vegetables. All you need the small pan for is to quickly saute your leeks before adding them to the main dish. Serve alongside with a loaf of french bread to soak up all those wine wine juice (egg free version here). 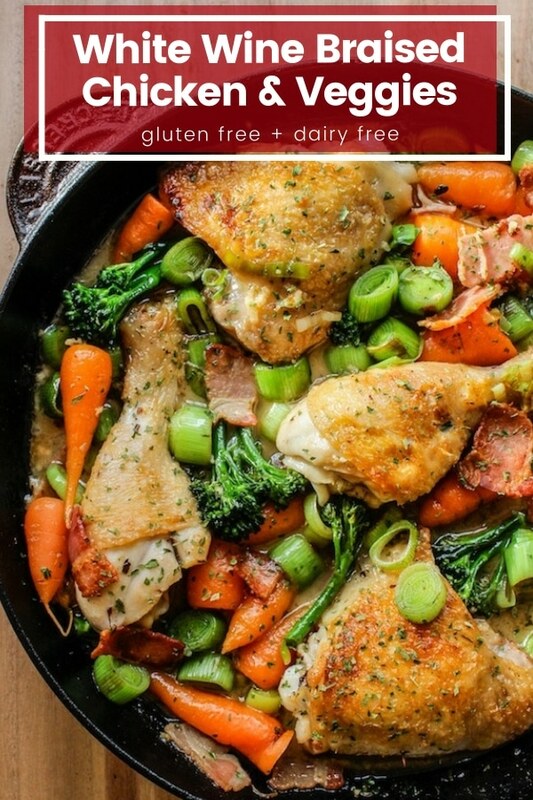 Don’t forget to #asaucykitchen on instagram if you this white wine braised chicken! I love seeing what you make! You can also post your pictures to my facebook page! 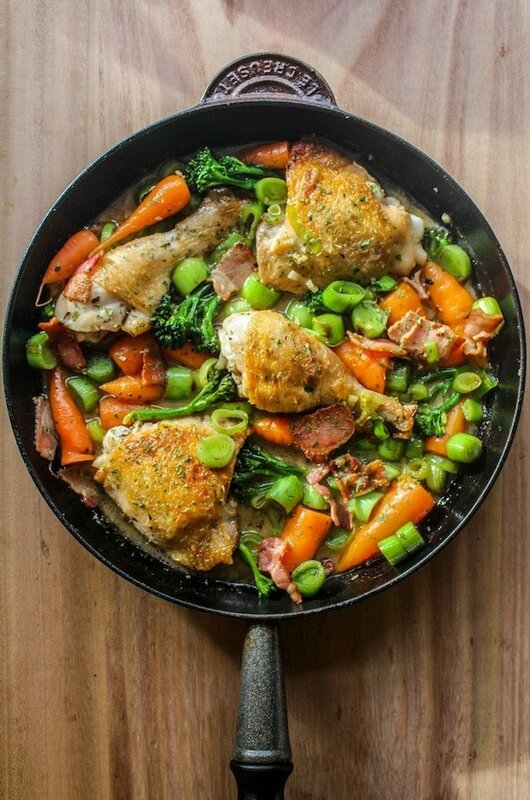 White wine braised chicken with carrots, broccoli, sauteed leeks, and bacon bits. In a large, shallow frying pan or skillet (you need one with a fitted lid) heat your oil. Season your chicken with salt and pepper on both sides and then sear the chicken, skin side down in the hot oil. Leave the chicken for about 5 minutes to brown before flipping it over and searing the other side to brown. After your chicken has seared on both sides, push the chicken to one side of the pan and fry your chopped bacon for a few minutes until golden. Add the minced garlic. When the bacon is cooked, spread the chicken around the pan evenly again. Slowly pour in the chicken stock and the wine and stir briefly and bring to a simmer. Cover and let the stock and wine simmer for about 20 minutes. Add the carrots and broccoli and simmer for another 10 minutes. In a small frying pan melt your butter or heat your oil. Add your sliced leeks to the pan and fry for 2-3 minutes until the leeks soften. Once softened and slightly caramelized, add the leeks to the chicken. Stir them in and leave the chicken uncovered for about 5 minutes. 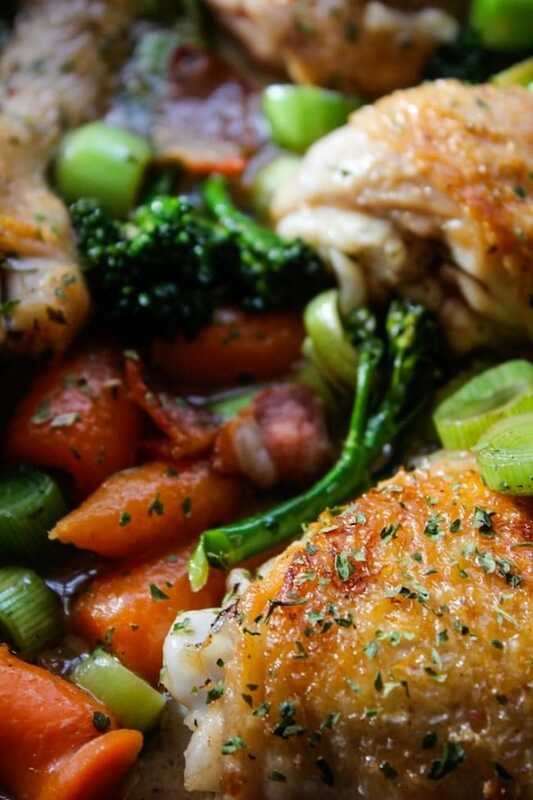 Once the carrots and broccoli are tender and the chicken has an internal temperature of at least 160°F/71°C remove from heat, scatter with parsley and serve. Nice Share! I’d definitely want to try this recipe. It just looks so yummy, I’m sure my kids gonna love this. Thanks for sharing. Thanks Katrina! Hope you all love it as much as we do! This was delicious! I can see how it might be a bit greasy though. Still I loved it, and this will definitely be made again! Thanks Rachel! Glad you enjoyed it! It was really good but I thought it was a little too greasy…next time think I am just going to sear the chicken on a pan that I coated with a paper towel and oil and then drain whatever grease is in the pan before adding the bacon and cook it in the bacon/ broth and wine. I’m glad you liked it! Sorry it came out too greasy for you – I think your idea to separate the chicken while cooking the bacon is a good idea though! This looks absolutely delicious! This is actually the kind of meals I make often – one pot, easy yet delicious meals in my cast iron skillet. Pinning this one for everyone to find! One pot/skillet meals are the best kind – minimal clean up and and easy to make is what I’m about. Thanks, Isabel! Thanks to this healthy and easy recipe, I can solve the mystery of what to make tonight! 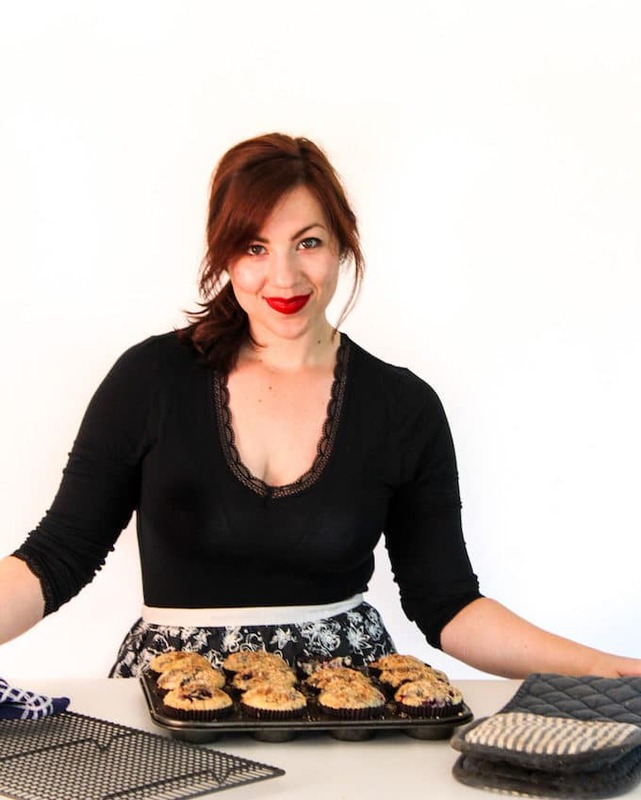 Thanks so much for sharing your recipes at my recipe round up! They look SO good! Your recipe has been featured this week on Full Plate Thursday. Hope you enjoyed the feature and your new Red Plate! Thanks, Angela! Hope you like it! This is my kind of weeknight meal… wine, bacon, awesome veg, not skinless chicken, few dishes, and an excuse for dipping crusty bread! I’m pinning this one for later! I’m totally envying your le creuset BTW! Thanks, Rachel! I love my cast iron! Mike & I were a bit hesitant to buy one at first because they can be pricey, but in the end I figured I’d rather spend more money on a quality item that I use everyday that will last forever than buy a cheap skillet that I’d have to replace in a year. Plus – I love the way it cooks things! Love the flavor combinations here, and your photos are gorgeous! Pinning! I’m just now getting my Hubs to enjoy dishes made with wine! He HATES wine so it took some convincing that cooking with wine is just another layer of flavor that’s so different from actually drinking it. I think this is a dish he would love. Can’t wait to try it. This looks fabulous and I’m already planning to make it next weekend! Thanks for linking up with us for Fabulous Foodie Fridays, I hope you have a great week! Thanks, Lauren! You have a great week too! This looks so comforting!! I am featuring this this week on Allergy Free Wednesday, thanks for sharing it! Braised chicken in white wine is a favorite around here. Your version looks absolutely gorgeous ! I just want to sink my teeth right into that chicken and eat this dish right up! Looks absolutely divine! Tantalizing dish for the eyes and for the appetite!! I really love the combination of ingredients. I am always looking for chicken recipes — thank you. Sarah, fab dish and beautifully presented. I would love you to stop by Food on Friday: Chicken over at Carole’s Chatter to add this to the recipe collection! Cheers! I guess this is going to be be my gourmet sunday next meal! thanks!!! Did you mean the chicken stock instead of cider? Yes! Thank you for pointing that out to me so I could fix the wording. This is the perfect one pot dish for the colder months. I am going to give this recipe a try! What a beautiful dinner option (and it sounds delicious too!) Pinning for later! Beautiful photography. Anything cooked in wine is a winner in my book. Great recipe! Such a gorgeous dish, and I love that you used leeks in here, they don’t get as much love as they deserve. I am obsessed with them! I agree – I love cooking with leeks! Thanks, Florentina! I want this chicken right now! It looks amazing and while I have similar dishes, none looks quite this wonderful. Pinned so I can remember to make this. I love this recipe. It’s so simple and looks fabulous. I love one pot/skillet meals. Pinning. What a pretty dish and one that the entire family will enjoy. Love the idea of cooking it all in a cast iron skillet. I must try this soon.